Ammon McNeely leading up Swoop Gimp. Zion Canyon has the most big walls in the United States and is arguably the country's most beautiful big wall and multi-pitch free climbing destination. There are hundreds of Grade IV climbs in the 800-1500 foot tall range and more than a few taller than 2000 feet. Some climbs are "sport wall climbs" meaning there is almost no approach and you can bail at any point on solid anchors. Other climbs involve intense bushwhacking through cactus-covered slopes followed by massive commitment on a week-long climb followed by a nasty descent. And of course, there are a lot of climbs in between these two extremes. What stands out about Zion is just how many vertical 1000+ walls there are. Zion Canyon is a similar size as Yosemite Valley. However, while Yosemite has just a dozen vertical big walls with a lot of low angle terrain and forest in between, almost the ENTIRE Zion Canyon is bordered by big walls ranging between 800-2500 feet in height. There are hundreds and hundreds of tall rock climbs and nearly endless cragging possibilities. What stands out about the free climbing in Zion is how wildly varied the cracks are. You can climb face holds on bullet-proof dark varnish (similar to Red Rocks) or jam straigh-in parell sided cracks (similar to Indian Creek). This ain't Yosemite! A lot of experienced granite climbers are terrified when they first climb here. It's hard to know exactly how strong the rock is so even bomber placements are sometimes suspect. It's not that the rock is terrible--it's usually just a little lower quality than Red Rocks or Indian Creek--it just takes a little getting used to. You place more gear than you would in solid Yosemite granite and you must develop a sense when the rock is strong and when it's crap. Watch for loose blocks in cracks and on ledges. Face holds may be rounded or sandy, and take some getting used to. Solid crack climbing skills are necessary. The cracks are generally vertical, have poor rests, and few face holds. The leader needs extra endurance to hang out in strenuous positions in order to place gear at least every 6 feet. Most climbers use athletic tape to protect their hands from abrasion. When sandstone is wet, it loses much of its strength. If this were just a safety issue, you could climb after a storm and maybe you would blow a piece or two. You probably wouldn't die. Wet rock, however, is an environmental and aesthetic issue. Climbing (especially aid climbing) on wet rock eats the cracks up and key free climbing holds blow off. You degrade the route. So how long should you wait after a storm? When the days after a rain consist of 100 degree heat, and the rock started out hot and dry, you can climb after a day or two. Wait at least a week in winter and early spring and when there is high humidity, cold temperature and already moist conditions. Sandstone cracks are mostly parallel-sided, which means they accept cams and often reject nuts and hexes. That said, a lot of Zion aid routes follow lines of piton scars so having 2-3 sets of offset nuts is key. On some routes like Desert Shield, it's nice to have 3-5 sets! Protection pulls, even from textbook placements. Be conservative, and borrow or buy a lot of gear. Two 50-meter or 60-meter ropes are standard for rappels. Always back up every anchor, including bolted anchors. While most of the classic Zion climbs have good bolts, there is no such thing as an absolutely bomber bolt or cam in sandstone. Be cautious. Here's the rack we at SuperTopo bring when we climb at Zion. This is just to give you a general idea of what to bring. See our latest big wall gear recommendations here. If the route is chimney free, I use a hydration pack. Long pants and good approach shoes or boots are strongly recommended for the often cactus-filled approach trails and the bushwacking descents. Sunscreen and sun hats for warmer periods, and warm gear and rain gear for anytime in the late fall through spring, where you can expect anything from hot periods to rain or snow. Don't forget the headlamp! On multi-pitch routes, many people get hung up behind slow parties or take longer on the descent than they expect. A headlamp is essential to get out of the canyons if it gets dark. A small knife is handy to remove old webbing at rappels. A cell phone could potentially save your partners life in an emergency. There is a fun boulder just inside the entrance station. You can't miss it. There are 10+ problems in the V0-V8 range. Most are tall so bring a good crash pad or five and some spotters. Another site is 0.5 miles north of the south entrance. Drilled Pocket Boulder is located on the west side of the road and is a slab with an obvious south-facing crack. 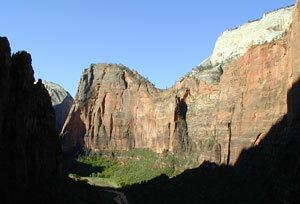 There are directions and photos to these areas and more in the Zion Climbing Guidebook. - When hiking, stay on approach trails and off the crunchy, black cryptobiotic soil. If there is no clear approach trail, stay in the bottom of river drainages when possible. - Keep your rack from scraping against the rock. 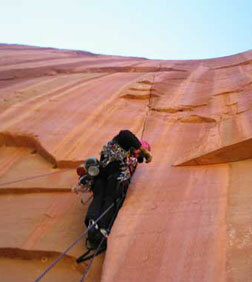 - While rappelling or belaying, prevent your ropes from carving grooves in the rock. Rappel slings wear out quickly in this environment; be prepared to replace them with rock-colored webbing. - Pitons destroy sandstone. Most popular aid climbs are done clean. - Use clean gear whenever possible (except cam hooks which damage the rock) - check to see if your intended route has been climbed clean. - Avoid hauling if possible. 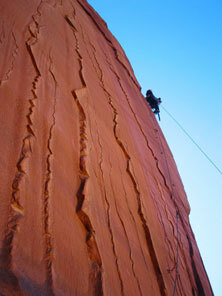 Some of the popular routes are getting scarred with white streaks where haul bags have scraped off the brown surface coloring of the sandstone. - Free climb as much as possible. Every time gear is weighted it erodes the sandstone a little more. It seems negligible now, but over decades, weighting gear as little as possible will extend the life of Zion's routes. Ammon McNeely at the Streaked Wall base. 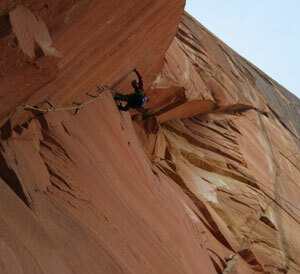 The town of Springdale is base camp for most Zion climbers. It's a pretty darn cute town: think of a mini Moab in a more spectacular setting. For most shopping, you can drive 30 minutes to Hurricane or 50 minutes to St. George. Air Travel. St. George has a small airport, about 50 minutes west of Zion, with pricey scheduled flights to Salt Lake City and Burbank. The closest larger airport is the McCarran International in Las Vegas, about a 2.5 hour drive. Salt Lake City Airport is a 4.5 drive to Zion. Spring and fall offer the best climbing conditions. Winters are unpredictable and summers are scorching and crowded. Temperatures in the sun and shade differ dramatically. With no wind, 65° in the shade can mean 100° in the direct sun. Always bring plenty of warm clothes and water. Some routes are closed for peregrine falcons from March-September. You will need to consider the water flow of the Virgin River when approaching climbs on Angels landing. In the spring and early summer it can be quite cold and tricky to cross. Fall: Climbing temperatures are often ideal from mid-September to mid-November with temperatures ranging from high-80s to mid-60s. It can be scorching in September, but few storms will be encountered. Winter: Winters can be extremely cold unless you are climbing in the sun. Before heading to Zion, check the weather to make sure that the high temp is at least 50° for climbing walls and 40° for the crags and boulders. Snowstorms are frequent and may last for days. Nighttime temperatures dip well below freezing even in the best winter conditions. The area usually doesn't get more than a few feet of snow each winter. All that said, if you can climb really fast on a south-facing wall, winter can be ideal. There are no crowds and aid temps in the sun can feel like 60 or even 70. Spring: Daytime temperatures begin to climb into the 60s and 70s in March. However, cold nights and possible snow can be expected into early April. Mid-April to mid-May offer good climbing temperatures, with more frequent wind and rain than in the fall. The tourist crowds show up in mid-April. Summer: Temperatures hover around 90-100°. Climb the most north-facing walls possible. Cragging at the Tunnel Wall in the early morning or late afternoon is a popular option. Depending on the season, Zion is a great place to hang out. Climbers visit the town in the spring and fall. Winters are empty and peaceful. Great camping abounds and motels are moderately priced during the off-season. Ammon McNeely on Desert Shield. - The South Campground is located near the South Entrance and Visitor Center. It costs $20 per night and is open from March 13 to October 31 on a walk-in basis (it fills up early in the day). -The Watchman Campground is also located near the Visitor Center . It costs $20-$30 per night and is open year round. Reservations are accepted for camping from late March through October or by calling (877) 444-6777. Campsites are available on a first come/first serve basis during the off season. - Lava Point is a first come/first serve, primitive campground with 6 sites and limited facilities (no water). Lava Point is located off the Kolob Terrace Road, about a 1-hour drive from the Zion Canyon Visitor Center. This is a seasonal campground (closed in winter). No reservations, no fee. Just outside the park there is free camping on BLM land of Highway 9 next to the Virgin River. There are no facilities so bring your own water and hold your poop for the NPS Visitor Center. There are low-priced motels in nearby Hurricane. - Cafeteria - Sol Foods (995 Zion Park Blvd (435) 772-3100) breakfast and lunch. Great patio. Outside of Springdale: If you are driving through Hurricane near breakfast time stop by the Main Street Café. It’s kind of the unofficial center of town where the local ranchers and folks often carry on conversations across the whole dining area. It’s good food and you will be entertained by the local color. Sol Foods Market (995 Zion Park Blvd. (435) 772-3100) has the largest grocery selection in Springdale. For a supermarket, drive 20 miles west to Hurricane. There is a Farmer's Market supermarket in La Verkin at the junction of SR 9 and SR 17.The biggest close Super Market is Lin's in Hurricane. Temple of Sinawava, and all campgrounds in the park. You will only find 3.2% alcohol content beer in Utah supermarkets. If you want the good beer and booze you have to go to the liquor store at the Switchback and pay a premium. Post office is located at 625 Zion Park Blvd. There is also a coin laundry at the Quality Inn. - Zion Outdoor Center - (868 Zion Park Blvd. (435) 772-0990) - Basic selection of climbing gear, guidebooks, and some climbing gear rental. Ammon McNeely on pitch 2, Rodeo Queen. There are a lot of great hikes in the park. Some of the favorites are: Chinle Trail, Coalpits Wash, Angel's Landing and Cable Mountain. 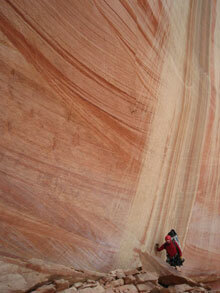 There are also a number of great slot canyons you can learn about on Tom Jones' web site. A popular tourist option is to hike The Narrows. There is world-class mountain biking just outside the park all within a 40-minute drive: Gooseberry Mesa, The Jem Trail and Hurricane Rim Trail. Bike Zion has topos and a lot more info. Even closer to the main riding areas is Over the Edge Sports (435-635-5455) Coral Cliffs movie theatres in Hurricane have a discounted “retro” night on Thursdays $5 (normally $9.00) on select current films.